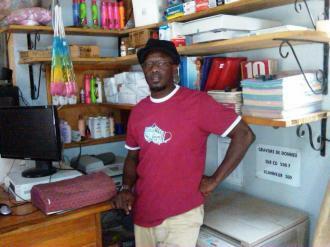 As a Client Relationship Manager intern in Dakar, I visited Massamba at his business last week. His shop is full of office supplies and other everyday use products. With printers, scanners, computers and an internet connection he can provide other business support services as well. He says, business is continuing normally but Massamba is anticipating with the presidential transition, an improved economic environment in the near future. With the loan money he received, he has purchased a hot press to print words and images on t-shirts, hats, and mugs. Through Youtube videos and friends who have similar machines, Massamba has mastered the technique required to use the hot press. The next steps are to first, advertise his new services and attract clients to order in bulk. Lutte match fans (Senegalese traditional wrestling) and informal soccer teams are both target customers, Massamba says. Second, an additional machine must be bought to cut the letters and symbols that are pressed on the products. Currently, Massamba is using a friend’s on contract. Picture to follow with Massamba and the new machine. Posted on April 28, 2012 by Julia Kurnia. This entry was posted in Uncategorized. Bookmark the permalink.